I really need to get back on track with my cooking-from-scratch and my experimentation. My time is being sapped by giving Gerry lots of love, affection and walkies. 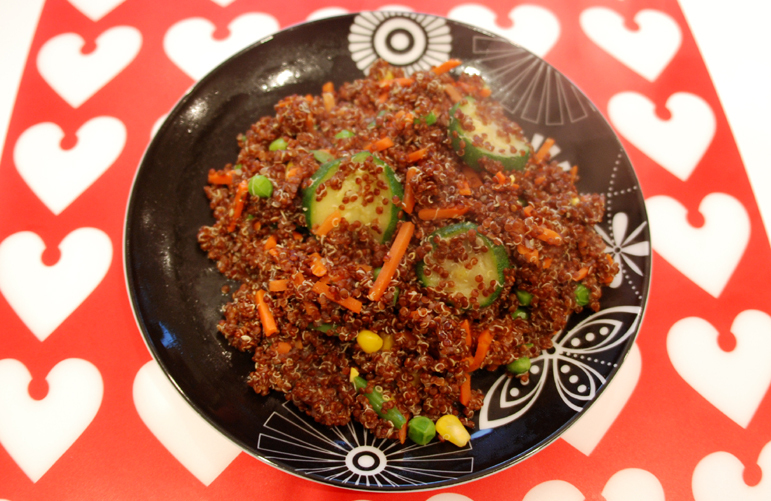 I decided to try cooking red quinoa today with some mixed veg, a little bit of vegan cheese and Aromat seasoning (yes, full of yeasty MSG yumminess but I don't care!) and it was very tasty - the red quinoa has a bit more of a crunchiness than regular white quinoa, and I think I prefer it. Quinoa is a complete protein and great for use in dishes instead of rice as it is more nutritional and tastes even better. Please excuse the steamy photo, as always I just can't wait to get tucked in! Another thing I've been looking out for in Dublin is white vegan chocolate buttons. I found some and wasn't disappointed, they tasted exactly like Cadbury's Milky Bar buttons and I'd love to make some cookies and cupcakes with them in the future. Have to try the red quinoa, sounds good! I can't remember the name of the shop!! It's one of those somewhere up George's/Aungier/Wexford street, I went in so many that day that I can't remember what I got where!!! :-0 Kinda annoying seeing as I want more! oh! so envious of those white chocolate buttons. there's just no vegan white chocolate to be found in these parts... and I love it. Some day I'll fly over to the UK and stock up! 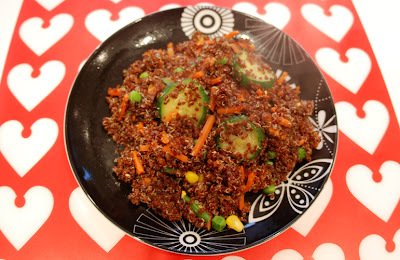 I did't even know red Quinoa existed! I will have to look out for it! Mamauk... so you finally were able to comment!! Glad it's working now :) The red type takes longer to cook I think, but it's really nice, definitely try it sometime. It adds more colour too! Amey where are you from exactly? I have only ever seen these buttons here in Ireland, and in the UK I found a lovely huge bar of white chocolate that was just spot-on, even the boyfriend thought it was exactly like the "real thing"! :) I will have to get my dad to send me a couple at Christmas! 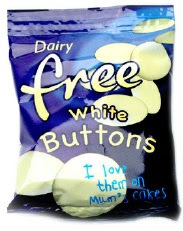 You can get the white buttons at some Tescos in the UK in the allergies section and I think Holland and Barretts stock them too.Might be worth checking those stores if you have them in Dublin.Was the bar the Venture Foods one that's got loads of vanilla in it? It's lovely and they do a 'milk couverture' bar too that tastes like Galaxy. 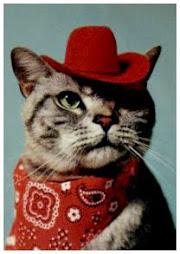 You can order there stuff from the Animal Aid shop online.